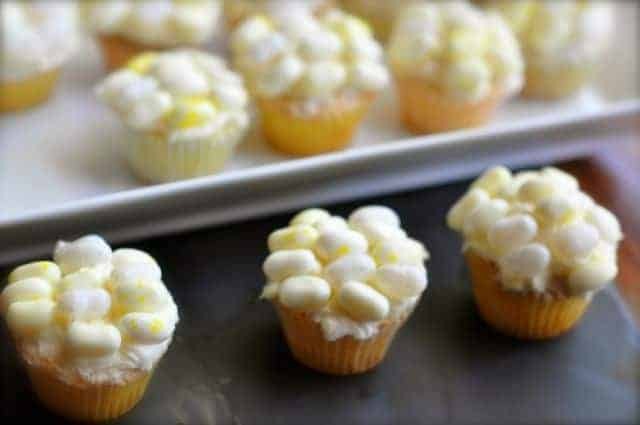 Corn on the Cob Cupcakes are adorable little cupcakes that you can make. These special cupcakes look just adorable, and thankfully you do not need to an expert decorator to make these. These are yellow mini cupcakes, a creamy vanilla bean icing, topped with jelly beans. I got my inspiration of these cupcakes from a Woman’s Day magazine cover. I never opened the magazine, but I was wanting to bring a little dessert to a party. My friends typically cook very well, so you want to bring something that that makes up just a bite or two. I used the mini cupcake cups for these, so these cupcakes were just about two bites of food. I also used Jelly Belly brand jelly beans, I used the Hot Buttered Pop Corn flavor, so these weren’t overly sweet. You can make these cute and adorable cupcakes for the summer. Prepare cake mix according to package directions. Follow package directions if making regular sized cupcakes. Mini cupcakes take 12 to 15 minutes to bake. Allow cupcakes to cool completely. The advantage of using the mini cupcakes is that they take much less time to cool. Prepare icing by creaming together the 8 ounces of cream cheese and the 4 ounces of butter together. When nice and creamy add 1 cup of powdered sugar, and then cream the mixture again. Add 1 teaspoon of vanilla bean paste, add remaining 1 cup of powdered sugar. Spread frosting on cupcakes, you can be generous with the frosting. Decorate the cupcakes with the jelly beans by alternating the yellow and the white jelly beans. I used mostly yellow jelly beans so it would look like sweet corn. I should hang my head in shame now 😉 Those are lovely. where did you find the Hot Buttered Popcorn, jelly beans? I found them at my regular grocery store. They carry the Jelly Belly brand of jelly beans there.